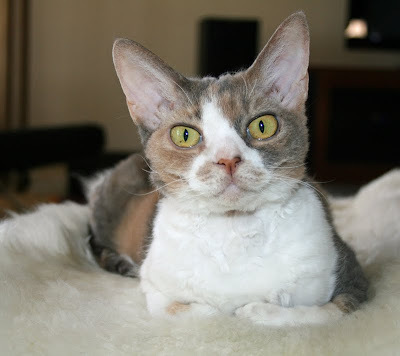 I have something to tell you today, about Harley. He is very wild and wacky and plays rough all the time. But he is also very sensitive! He can get skerred very easily, and when he does he gets very uncertain and runs away. A few of the things that worry him are loud noises, new things, and anything he does not understand. He usually goes away to be by himself for a couple of hours to figure stuff out. Remember when he got skerred of the balloon?!? The catnip bubbles also worried him a little bit. Sorry I told, Harley. Even though I have a little head, I got a big mouth. Do not worry, we are very understanding of Harley's sensitive side and try our very best to never make him get upset or worried. It's okay to be a little scairt, Harley! Virus is afraid of cats (uh.. yeah..) but sssh.. don't say we told anyone! Gandalf spends nearly every single thunderboomie hiding, Harley. Do not worry. It's Ok to be askeered of a couple things. I am very understanding as I am scared of lots of things too. I am scairt of strangers, childrn, men, cuddles, snuggles and the furminator. I go and hide away sometimes too. Don't worry Harley. Alice is scaird of EVERYTHING. And having a sensitive side just makes you sexier! I get scairt of things too Harley. It's okay. I think lots of cats get scared of things. I know mine do! I didn't know you has such a big mouth, Daisy. Wow! Daisy, it's actually good to know that Harley is scared of the same kinds of things that bother lots of cats. Makes him seem more "normal". That was very nice of you Daisy to tell us about Harley being a little afraid of some things. There are a whole bunch of cats here that are just the same. Everyone here runs in all directions if a stranger walks in the yard and even worse into the house. So Harley don't feel bad. We love you anyway. Hope all of you have a fun day. Daisy, I know that you told so that all your friends would know not to do anything to scare Harley, and that's very thoughtful and sisterly of you. Everykitty has their fears. All those traits make Harley the more endearing! It's okay, Harley. I get scared sometimes too and I'm all grown up. Today it is VERY windy here and I am very scared. Eeeek! you're a good big sister. me too harley! we are twins! I like that figure it out- good way to put it. I get scared sometimes too Harley. 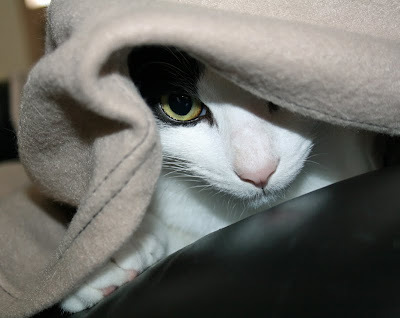 I hide behind the sofa. Harley it's ok! Our biggest toughest mancat here, Nigel, is also a 'fraidy cat sometimes. Mom says it's because of what probably happened to him before he found us. We just let him be himself and he gets a little less afraid all the time. judging from his "how things work" postings, harley eventually does figure things out even if it may take him an hour or two. We all get scared sometimes Harley - with us it's mostly baskets, car rides and v-e-t-s, especially man v-e-t-s cos they've got big hands. Daisy and your mom and dad will look after you. I recently received a balloon for my birthday. Both cats were scared of it. But Sage to the point where it made me feel terrible. :[ We understand Daisy! Some of us are skerred of different things, too. Maybe that is where the term 'scardy cat' came from? Happy Tuesday to both of you! Harley is lucky to have you for a big sister, Daisy! Oh Harley you are such a sweetie! oh Harley, sensitive mancats are what all the ladycats are after. Poor Harley! We have quite a few sensitive poodins here at our house. And then we have quite a few unsensitive poodins here at our house. It's okay to be scared, Harley! In our house, Derry is scared of a lot of things. He'll even run away if our mom approaches while carrying bags or some other large object. So he's a real 'fraidy cat, but we love him anyway, just as you are loved! Awww! My Nixon is a big scaredy cat. 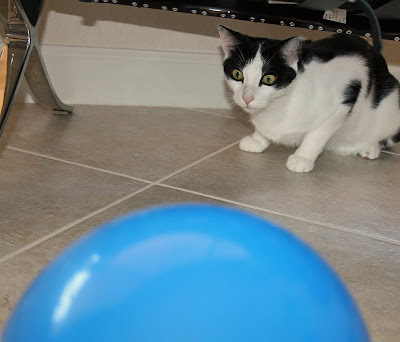 He's afraid of balloons and cat nip bubbles, as well. :) Silly boys! Oh poor sweet Harley. And those photos are just wonderful. Awwwwww!!!! Harley being scairt is okay!! Me and Clemmie get scairt all the time!! Loud noises and lawnmowers are the worst!! 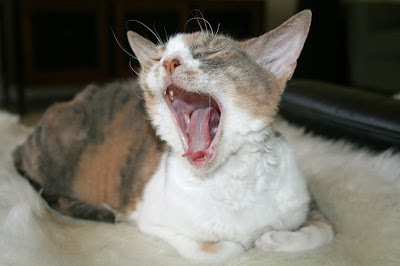 Daisy we just love the picture of your BIG mouth!!! Hehehehehehe!! Brave Mancat stuff takes practice. Harley is way more complex than he seems on the surface. Harley, Cosmo is a little worried too...you are in good company! It's of for men-cat to have a sensitive side. It's alright that you are a sensitive Mancat Harley. We think that makes you even more endearing than you already are - if that was possible. My sisfur Isabella doesn't get skairt of anything but I do so I understand. Everybody's got somethin', Miss Daisy, don't they? I'm just glad Harley's got an understanding sisfur. It takes a strong mancat to face his sensitive side. We know Daisy is just trying to help you! Harley it is ok to be afraid of things - and we understand that if you are uncertain about something you need to go think about it! We are all afraid of some things - we bet even Daisy is afraid of stuff. And we totally understand about the bubbles - they confuse us a lot too, and well some of us have run from them before. We think you are totally normal! Plus, the ladycats do like a man who is sensitive - so this could really get you a lot more ladycats interested in you! 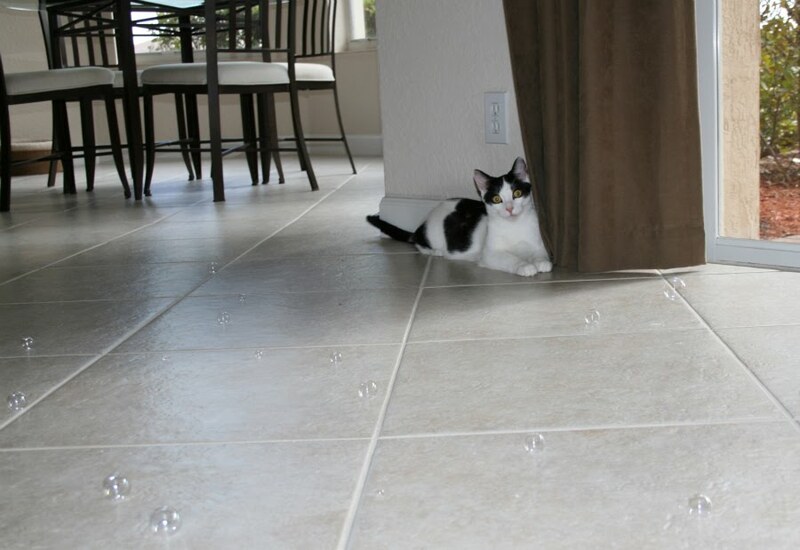 And if it makes you feel better our big brother Floyd (who was a very big cat) was afraid of ants! So even giant cats get scared! You are a sweet big sisfur to tell about Harley's scairtness. That way we can all be sure we not make him be sad. Dont worry that ya told, Daisy. Thats what Big Sisters are SPOSED ta do! I always new he was a sensitive little guy so it's good you are watching out for him. Miles and I have our skerrdy stuff too. bonkbonks to both of you! We think that's a cow kitty thing! Kenji and Yuji are always scared of new stuff. And they're sensitive, and both Mama's boys. The tortie team here is not afraid of anything! We are so curious about everything! I won't repeat a word of it. Please tell Harley to not worry about being scared for things. Lots of them scare me too! I know you do everything possible to make him feel relaxed. ::Whispers:: I don't care for loud noises either. Oh Harley, I am sorry that your sister some of your secrets. This is when I am glad not to have a sibling. Watch out she might start to blackmail you. I think Daisy is being a pesky sister! Oh Harley...love your "Balloon" eyes! Nor do we mock his pop-eyed look of panicked bewilderment as he gazes on that bizarre blue ball of air that's sitting on the floor in front of him. Harley, maybe it's something about us black & white guys 'cause, as big as I am, I'm the same way. Mom says I'm skittish. Don't worry, Harley, everybuddy gets a little scairt sometimes! OMG the balloon pic was hilarious. Yoor description of Harley is just like Alfie Marshall. He is scared of efurryhting too. He's even frightened of his own shadow sumtimes. but we make sure he is safe too. I is not scared of anything! But Kalie is. She do not like loud noises. Or cars. Or rains. Or winds. Daisy werent yoo skared when yoo wuz a wee kitten too. hes just bein careful.